Many are aware that Pennsylvania is facing a substantial budget crunch due to excessive debts. But just how bad is Pennsylvania’s debt? Well, the financial hole Pennsylvania is in is so deep that it will cost tax payers $16,800 each to bail out the state and it will rob countless government employees of their pensions. Pennsylvania tax burden for everyone has doubled since 2009. Nevertheless, there is no clearing in sight. This crisis has been ongoing for some time but has been largely ignored due to political expedience and bad accounting. For a long time, state governments and local municipalities were allowed to hide their long term debts. Non-profit Chicago analytics group Truth in Accounting, founded in 2002, made it their stated goal to provide transparent reporting of state and municipal debts, expenses and liabilities. Due to their efforts, a recent ruling was made to force State and Local municipalities to begin showing their total debt figures. Truth In Accounting has pioneered realistic methods for accessing state and municipal government indebtedness. Utilizing their auditing conditions to create a Comprehensive Annual Financial Report for each State, Truth In Accounting, or TIA, has exposed just how bad the future tax burden for tax payers will be. For instance, Pennsylvania supposedly only had a deficit t of 2 or 3 billion dollars. But this figure ignores future obligations like bonds, underfunded pension liabilities, and unfunded retiree healthcare cost. When these debts are included Pennsylvania’s unpaid bills total $74.2 billion dollars!!! In other words, there is no money to fund the retirement of government employees. The federal government has the ability to print money in an attempt to delay inevitable shortfalls. States have no such freedom. The stark reality is that many government employees will have to face the fact that there pensions will be cut. Furthermore, unlike private companies, there isn’t an insurance company ready to step in to salvage state or local government pensions. 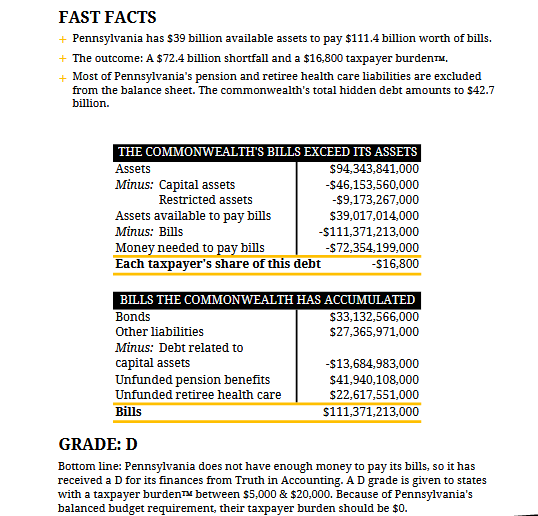 To arrive at the $74.2 billion dollar figure you take Pennsylvania’s total assets minus capital assets (these are things like building and infrastructure) and restricted assets. This will provide the total amount of assets available to pay bills which for Pennsylvania is $39,017,213,000. How do we arrive at Pennsylvania’s bills? We take bonds, other liabilities, unfunded pension liabilities and unfunded future health care liabilities in order to come up with a total bill- This is basically all the debts Pennsylvania or in other words the Pennsylvania tax payer will have to pay back. We also minus out any debt tied to capital assets. This will give us a total bill of $111,371,213,000. When we combine to two figures we are left with a bill of $74.2 billion! Scranton has one of the worst fiscal problems in State of Pennsylvania. What would happen if we applied this same analysis to Scranton? What would Scranton’s financial health look like? Stay Tuned!